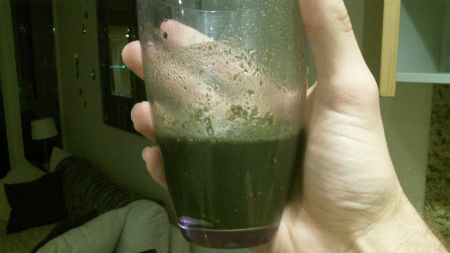 Amazing Grass Green Superfood is pretty good stuff! seemingly one of the only companies that avoids skeezy marketing claims and also embraces the customer centric web 2.0 business model. As a company they have different lines of superfood products that cover greens, berries, kids, and total meal powders, all of which are very good. However, I believe their green superfood is their oldest and flagship product. It’s probably the most popular product of its type in the world. It’s what I used for this review. Let’s get started! Disclaimer: I am in no way affiliated with the Amazing Grass company. I write these reviews to inform curious consumers about the details of these products and bring transparency to the market. I highlight the pros and cons of products not to glorify or tear down a company or product, but simply to give consumers a clear idea of what they’re buying. I think all of these products have a lot of benefits to offer if used properly. If I state an opinion I make sure make it clear that it’s just that, and others may have different experiences. The ingredient list for the Amazing Grass green superfood is very solid with an emphasis on high quality grasses and organic ingredients. Let’s break these down a little bit more. There are no juices or powders, just raw whole food ingredients. 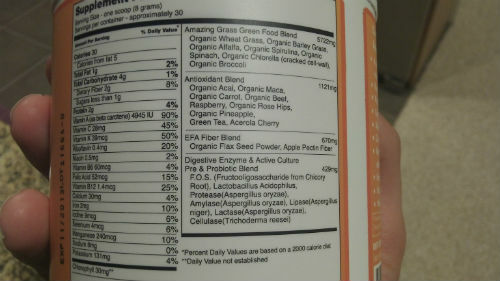 For example, wheat grass >wheatgrass juice, >wheatgrass juice powder in terms of nutrient density. The difference isn’t that big, but it’s rare that you’ll see a superfood concoction without any juice or powders. So kudos to them. It has no lecithin in it, which will please certain superfood powder consumers. Lecithin is an essential nutrient that I’ve written about before, but some people prefer not to have this ingredient in their greens powders. Spirulina, chlorella, acai, green tea, broccoli, and acerola cherry are very nice ingredients, and some of my favorite green drink additions. It really has a fantastic price! A 30 day supply costs at most $27.99, which is very low in the superfood powder arena. For its price point Amazing Grass has an impressive variety of nutrients. Often if you’re talking about less than $30 for a greens powder you’ll be looking at a simple mixture that might be lacking probiotics or sea vegetables, and will instead focus on a small number of ingredients. Not the case here. In general I think the combination of balanced nutrients, low price and quality ingredients is what most stands out about amazing grass. The Green Superfood is….you guessed it….green! Amazing Grass has a very deep, “earthy” taste to it. As a longtime drinker of greens powders I quite like it. It definitely has texture and grit and in my opinion it’s refreshing. Whenever I get a new greens powder the first thing I do is take a dry scoop and eat it right from the bottle. Using this criteria I thought the taste of Amazing Grass was fine. Lord knows I’ve had worse. For people new to greens powders I usually recommend taking them with juices or smoothies to make sure you’re accustomed to the taste, just in case. Many people are so accustomed to sweetened foods that making the transition to drinking foods made of condensed nutrients can be quite an adjustment. Mixing your superfood mix with natural sweeteners will ensure you enjoy it. Amazing Grass has a very useful section on their website about the different recipes their customers have used and I’d highly recommend any curious consumer take a look at it. It’ll give you a good idea of the different ways you can use Amazing Grass if you don’t want to drink it by itself. Their line of green superfood mixtures also comes in different flavors, such as berry, lemon lime, or orange dreamsicle. I’ve tried them myself and they’re a great choice for someone who prefers something a little more flavorful than regular wheatgrass. Amazing Grass has a great price. On its website you can buy it for $27.99 for a 30 day supply which is excellent. And of course, I’ll wrap up this review with perhaps the most important observation of all…..did it make my body feel better? For me the answer was yes. I went through my 30 day supply in about 8 days, but definitely noticed sustained energy levels and mental acuity during this time. Of course it’s always difficult to pinpoint causality for these things….but it certainly didn’t hurt. That’s a very good endorsement. I drink different greens powders regularly and so am pretty immune to the majority of their benefits. Like I said before, I like Amazing Grass and their Green Superfood. In my superfood powder buying guide I noted that they’re probably the best choice if you’re looking to maximize price and nutrients on a budget. I still think that’s very good advice. It’s a good choice for someone looking acclimate themselves to green drinks, and I think the company really does an excellent job with customer service and how they brand themselves. And in my opinion, they have perhaps the best formulated product line of any company in the genre. Their different superfood offerings all do a good job of building on their original product, while providing additional ingredients that make them very distinct. I’m looking forward to their recently released energy bars, and I think the company has an awesome future ahead of it. you can get the Amazing Grass, Antioxidant Berry Drink Powder (the large 27.4 oz tub) for less than $43.76 if you use the coupon code ZEQ860 or by following the link (promo code will automatically be applied at the end.). My boyfriend and I also got free shipping, and compared to our local stores, that was REALLY cheap!! The tub has a 100 servings, so with everything it ends up being 0.43c per serving – can’t beat that!Trying to spread the love of a good savings. Great Product! Coupon appears to be valid for first time buyers only. Hi I read a review, http://superfooddrinks.org/amazing-grass-green-superfood-review/ about Amazing Grass and it was a favorable review. My question to you is that I’ve looked at dozens of green drinks and Amazing grass does not seem to have nearly the variety of superfoods in its formula as compared to other, similarly-priced products. Your thoughts? Good comments! Amazing grass is good, but in my opinion its best features are its combination of a solid ingredient list w/ low price and high quality certifications (ie, organic). You’re right that it doesn’t have the most robust mixture of ingredients….I’d say boku and pure synergy are best in that regard. Does this contain yerba mate? A commenter on Amazon is saying it does. Grace, I believe their energy mix does, but the other options do not. You give a detailed description of green super food which is very impressive & effective. I am sure that people get lots of benefit from your article. This is a great review! 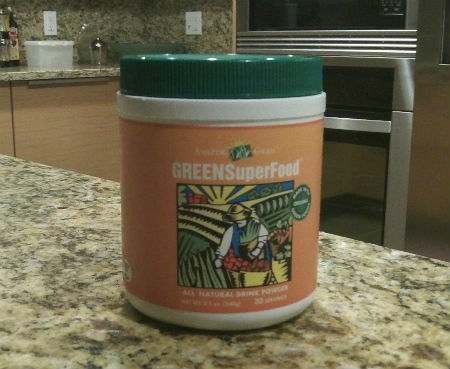 I just started a 21-day cleanse and am using the Amazing Grass Green Superfood powder in my daily smoothie. I love the taste and love the fantastic ingredients – at the risk of sounding punny the powder kicks grass! Punny indeed! But I’m glad you like it! I’m not too sure you’re right on it being the product to beat, at least in the UK. The product which is taking the UK market by storm is from a company called On Group Ltd who have a product called Pure Mega Greens. I swear by this product but I must admit although I have tried Amazing Grass, it wasn’t for a long period but I didn’t notice much difference and Pure Mega Greens is cheaper (again in the UK at least). Take a look at this green superfood for a good alternative. Thanks Larry. I’ve never heard of Pure Mega Greens but I’ll be sure to take a look at it. You can now get AG at Costco, the original, 45 servings for 22.79. Did you ever look into products by Mother Earth Labs? I’ll be sure to take a look at it.